Events in recent years have underscored the need for Singapore to ramp up its transport infrastructure, as well as to rejuvenate what has already been built. Overcrowded trains and buses, long and unpredictable waiting times, and glitches in the rail system have been top grouses since as early as 2004. It did not help that Singapore's population grew by more than 30 per cent in the last decade to hit 5.4 million last year. Public transport ridership soared by more than 50 per cent over the same period to 6.36 million trips a day. Meanwhile, two major rail breakdowns in December 2011 brought into sharp focus the need for infrastructural upkeep on the back of fast-rising usage demand. The Government has responded fairly swiftly. But experts say a sustainable solution to managing public transport demand also needs measures such as increasing flexi-work arrangements, telecommuting or decentralised office hubs. On the capacity front, the Government is setting aside an estimated $2 billion to replace ageing parts in all the major rail lines together with rail operators. It is also in the process of rolling out a bus service enhancement programme - likely to cost in excess of $1.1 billion - which will boost fleet size by 20 per cent. And in January last year, it announced a slew of new lines that will grow Singapore's rail network to 360km - double its current length. This is on top of $60 billion of investments in place for ongoing projects such as the Downtown and Thomson lines. In all, transport-related projects may cost more than $150 billion. This is more than 40 per cent of Singapore's total foreign reserves last year, and seven times the 20-year transport infrastructure spending envisioned by a White Paper released in 1996. By any measure, it is a highly ambitious programme. The question is, will it be economically sustainable to go on ramping up capacity this way? This is especially when capacity is often designed to cater to peak demand, which is usually less than two hours in the morning and two hours in the evening. Hence such a network tends to be "underutilised" for the rest of the day. Average bus occupation, for instance, is only 20 per cent. Transport experts have thus called for other measures such as promoting flexible working hours and telecommuting. Attempts to stagger working hours were made back in the early 1970s to ease traffic congestion. But the campaign never did gain much traction. According to a study published by the Manpower Ministry in 2001, flexi-time was practised by only 0.3 per cent of all private-sector employees. Telecommuting was even more uncommon, with a participation rate of merely 0.1 per cent. And those who work entirely from home accounted for just 0.01 per cent of employees. While more current figures are not readily available, there are signs that flexi-time is still not widely accepted. Last June, the Transport Ministry launched a year-long free-tra-vel initiative to encourage commuters to travel just before the morning peak, following a Travel Smart initiative rolled out in October 2012 to persuade people to shift their peak-hour travel time by 15 minutes. Response was encouraging initially, with around 9 per cent of peak-hour commuters travelling earlier. But this has since fallen to 6 to 7 per cent. Certainly, the scheme has potential for improvement - perhaps even without additional tax spending (the year-long free tra-vel initiative costs $10 million). In 2004, a study by the UK Strategic Rail Authority found that train overcrowding can be eased substantially by widening the differential between peak and off-peak fares. This means giving off-peak fare discounts or wai-vers, as well as raising peak-pe-riod fares. Not only does this help the operator maintain financial viability, but the shift of peak demand also reduces the financial burden of having to run additional trains during peak hour. Analysts suggest the savings here would more than cover the cost of providing free fares. However, adjunct Professor Paul Barter, who teaches transport policy at the Lee Kuan Yew School of Public Policy, says there are limits to what flexi-time arrangements can do to flatten peak travel volumes. This is because there is "dynamic tension" between two things that people want: a regular schedule that gives them fixed times at home or with friends, and more comfortable travel. Because of this tension, people will modify travel patterns "even without the Government doing anything". And if there is less overcrowding during the peak period because some commuters have altered their travelling time, others will move in to fill the space freed up. Prof Barter, however, notes that flexi-time can contribute to shorter peaks, which range from "five to 10 minutes in Canberra to three to four hours in Jakarta". Also, if people were free to adjust their travelling time, "they would complain less", he said. He feels that many employers in Singapore "are more rigid than they need to be" in this respect. Indeed, a survey by the Land Transport Authority in 2012 found that the top reason for workers not telecommuting was that employers rarely allow it. And about 80 per cent of 1,500 people polled said they would take up flexi-work arrangements if these were made available. Finally, experts say a decentralised city is key to improving accessibility without increasing mobility. Even though Singapore had a decentralisation strategy since the 1980s, it has not gained much traction - until now. "There was a time when it was felt that having a big CBD (Central Business District) was good for the economy," recalls Prof Barter. "But I think it is better to have many sub-centres across the island." Now, several sub-centres are in the works, including Jurong Lake District, Woodlands and the Kallang Riverside. All these will allow more people to live near where they work, and work near where they play. Meanwhile, cities the world over are increasingly looking to "soft" demand management measures to spread out peak loads on transport systems. In 2008, Melbourne started offering free travel to commuters who arrive at the CBD before 7am. 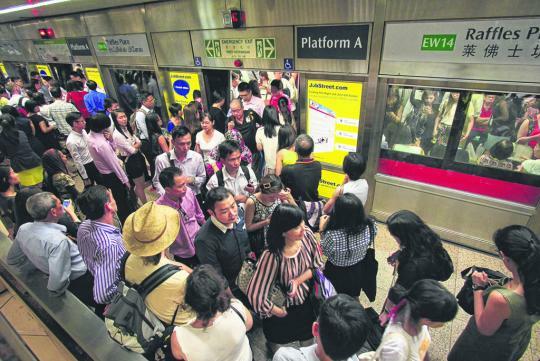 It led 23 per cent of commuters to travel out of peak hours. Monetary measures are not the only way to temper peak demand. In the run-up to the 2012 Olympics, London embarked on a public education and awareness campaign to prepare for the foreseeable surge in travel demand. The programme included reducing the need to travel, spacing out journeys, shifting to walking or cycling, as well as re-routing to less busy routes. Despite record ridership - London Underground, for instance, carried 4.52 million passengers on Aug 9, the highest in its history - the transport network coped well. Elsewhere, Abu Dhabi has spelt out a transport mobility management strategy as it prepares for a possible trebling of its population by 2030. It includes park-and-ride, car-sharing, flexible working hours, and telecommuting plans. All these are in place in Singapore, even if they lack scale. Last year, the Urban Redevelopment Authority unveiled plans for a 700km cycling path network by 2030 - thrice the length of the current network. And URA chief planner Lim Eng Hwee leads by example: He cycles to work. I find that govt not only have to improve the transport infrastructure, it will sooner lead to other problems when the population keep increasing. . . They need to have a foolproof plan for the whole social equilibrium. Let's say give more incentive to business owner to operate their business in semi-peak hours. Not all businesses need to rush to the office at 8am. And transportation really is bad now. govt need to understand how we travel and work on how we can improve our lifestyle. In the past, i find the feeder bus is great when i am alighting from a MRT station and wanna travel back home. Maybe they need like minibuses to commute people in city area. Just my 2 cent worth of thoughts.